As a young child, I always thought of my Grandma and Grandpa George as being so old. And of course, I thought that they lived boring, mundane lives. Oh, how wrong I was. As I have delved further into my research of my grandparents, I have discovered their lives were anything but boring! Here is the first part of the story of my grandfather. 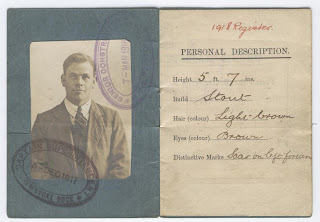 On 19 August 1894, Joseph Brinley George was born to Joseph George, and his wife, Anne Davies. Brin was the youngest of 6 children. The family lived in Sea View Cottage, Hazelbeach, Neyland, Llandstadwell, Pembrokeshire, Wales. As a young lad, Brin would often spend time at the beach watching the ships come into Pembrokeshire Dock. In 1908, when he was 14 years old, Brin began a six year apprenticeship as a shipwright at Pembroke dock, as small shipping dock yard. At the age of 88 he recalled "For the first year you got nothing, and the second year the pay was two shillings a week." In the sixth and final year, the pay was 6 shillings weekly. After completing his apprenticeship, Brin did steel work on ships for five years. During the Great War, he made repairs to battleships at the British naval base at Scapa Flow, a channel in the Orkney Islands. 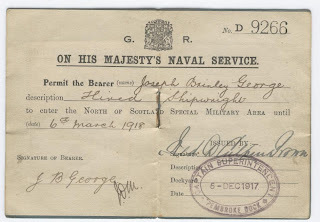 Joseph Brinley George, Naval Permit. Digital Image. Privately held by Kathryn Lake Hogan, Windsor, Ontario, Canada, 2008. During his time of service in the Orkney Islands near Scotland, Brin met a young lass named Agnes Kirk Dewar, known as Nessie. It is likely he met her while he was on shore leave. Nessie lived in Dunfermline, Fife, Scotland with her parents, Robert Marshall Dewar and Mary Logan Kirk. When it was time for Brin to return to the naval base, more than a parting kiss was exchanged between them. Shortly thereafter Brin received notice that Nessie was expecting. Being an honourable man, Brin did the right thing. He and Nessie were married 26 February 1919 at her parents' home, #4 Garvock Terrace, Dunfermline. Brin returned to the naval base, and Nessie continued to stay with her parents. On 12 September 1919, Angus Brinely Dewar George was born. Unfortunatley, Nessie experienced a terrible delivery. Angus was born with what we now call cerebral palsey. Nessie contracted puerperpal fever. Puerperpal fever, also known as septicaemia (blood poisoning), was an infection after childbirth due to poor midwifery techniques especially antiseptic measures. Infection entered through injuries to the birth canal leading to septicaemia and often to death. It occurs within 3 weeks of childbirth. Notice was sent to Brin that the baby had been born, but Nessie was not doing well and he was to come right away. I don't know how soon after the birth Brin arrived at Nessie's side. Nonetheless, he was there when she died at 9:00 p.m. on 21 September 1919, just nine days after giving birth to Angus. Which side of it will you be on?" Now if things weren't bad enough already for Brin, they continued to get worse. When he returned to the Naval Base, he received his Notice of Discharge. Joseph Brinley George, Notice of Discharge. Digital Image. 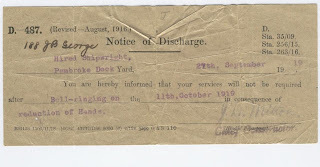 As World War I had ended, there was no longer a need for such a large work force at the dock yards and Brin was let go. Within a span of three weeks, Jospeh Brinley George, age 25, in the year 1919, had become unemployed, a father and a widower. Full citations and sources for this post are available upon request.